You may need to convert formulas to Values in Excel if you work with a lot of dynamic or volatile formulas. For example, if you use Excel TODAY function to insert the current date in a cell, and you leave it as a formula, it will update itself if you open the workbook the next day. If this is not what you want, then you need to convert the formula into a static value. In this tutorial, I will show you various ways to convert formulas to values in Excel. Using a cool Mouse Wriggle Trick. This is one of the easiest ways to convert formulas to values. A simple keyboard shortcut trick. Select the cells for which you want to convert formulas to values. This would instantly convert all the formulas into static values. Caution: When you do this, you lose all the original formulas. If you think you may need the formulas at a later stage, make a copy of the worksheet as back-up. If you are not a keyboard shortcuts fan, you can use the paste special option that can be accessed from the ribbon in Excel. 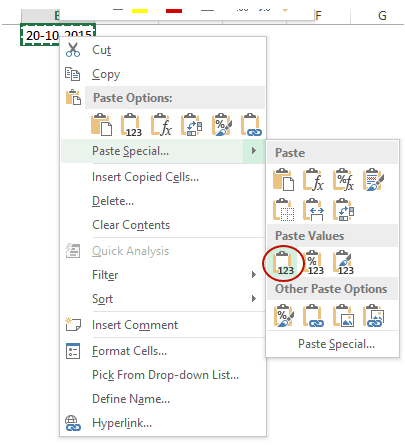 You can also access the same paste special option if you right click on the copied cell. Hover your mouse on the Paste Special option and you will all the options within it. This is one mouse trick that not many people would know. Bring your mouse cursor over the outline of the selected cells. (You will see an icon of four arrows pointing in the four directions). Press the RIGHT button of your mouse. Hold the button and drag the outline to the right and bring it back to its original position. As soon as you leave the mouse button, a menu would appear. Click on Copy Here as Values only. That’s it. It will instantly convert formulas to values in the selected cells. Hope you found this tutorial useful.